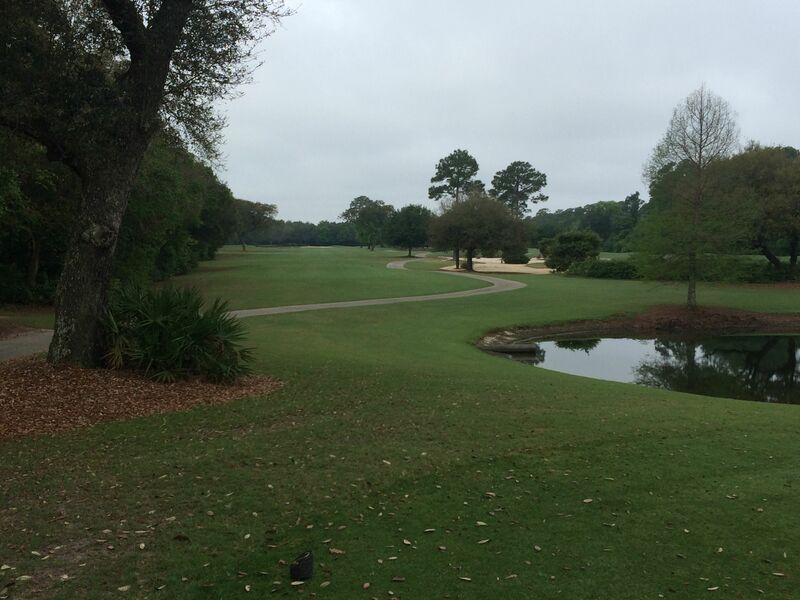 Peninsula Golf Club is the most well maintained course we played during our Gulf Shores, Alabama buddies’ trip. 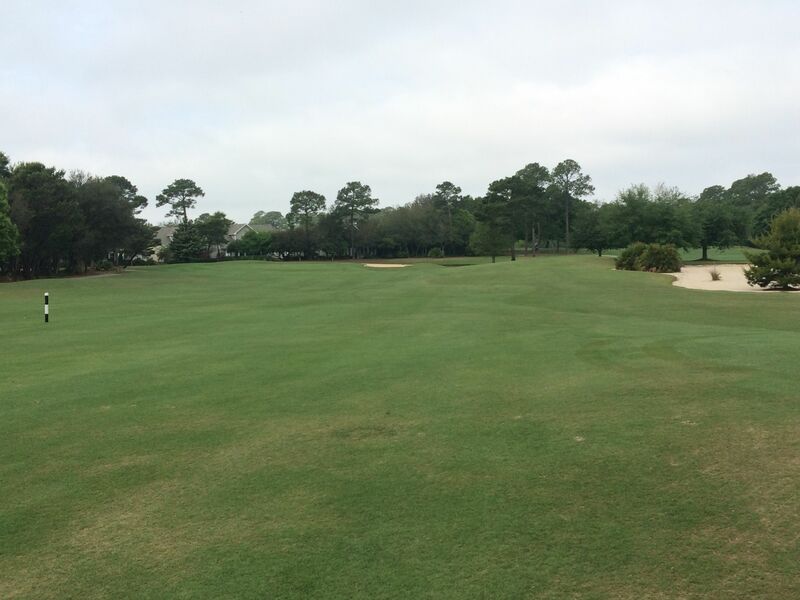 With the exception of the Lakes course, which was still recovering from a bout with harsh weather, the Cypress and Marsh courses’ greens were fast and spotless. Evidence of the great care the staff provides on this property was everywhere: Fast greens, well maintained fairways and tees, nicely raked traps. 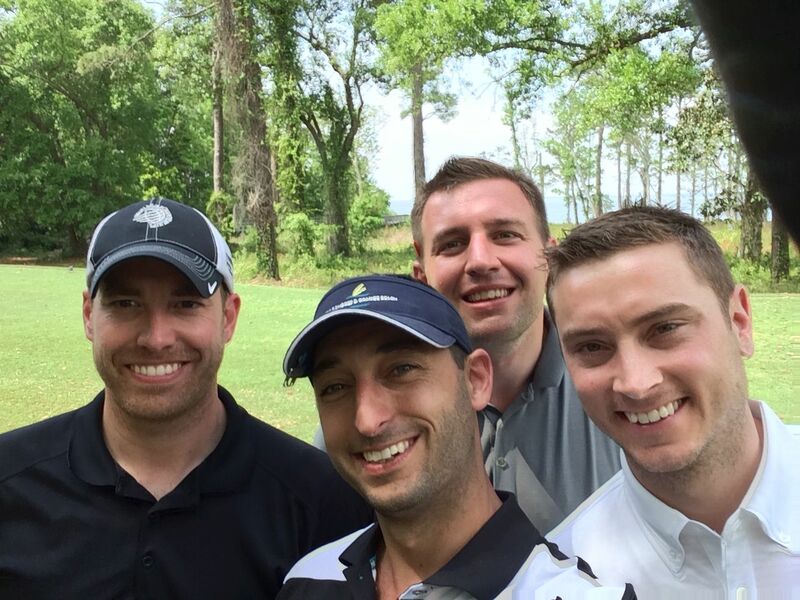 Our group was extremely impressed with the conditions we found at Peninsula Golf Club. 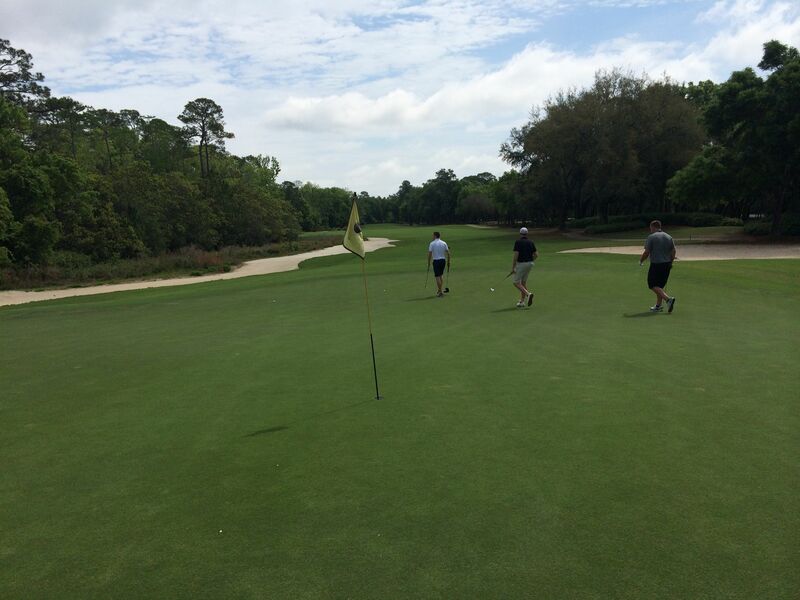 Like Kiva Dunes and Craft Farms, Peninsula Golf Club is an Honours golf property, which means the conditions are impeccably maintained and hospitality is held to the highest standards. 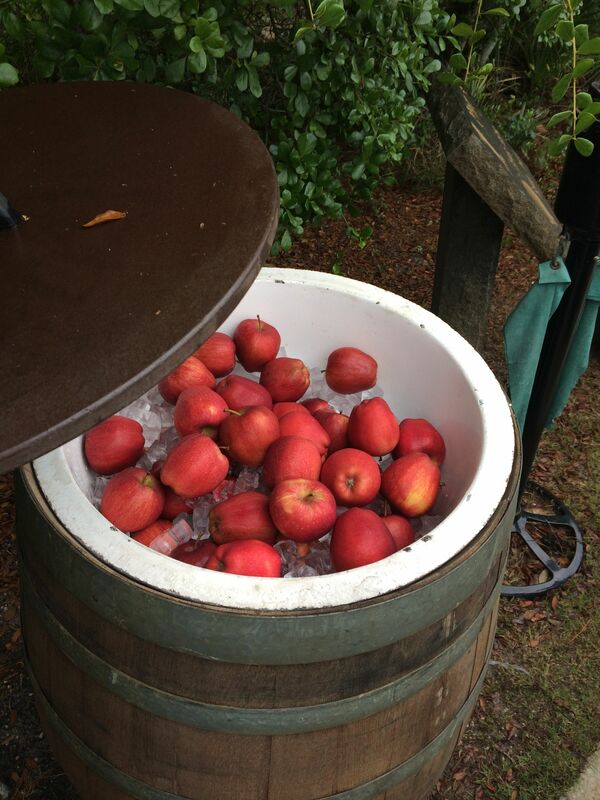 It also means that delicious red apples are complimentary at the start of each nine holes! Peninsula has a nice practice facility, which we rushed out to prior to our morning tee time to hit a few balls before mostly warming up on the course. 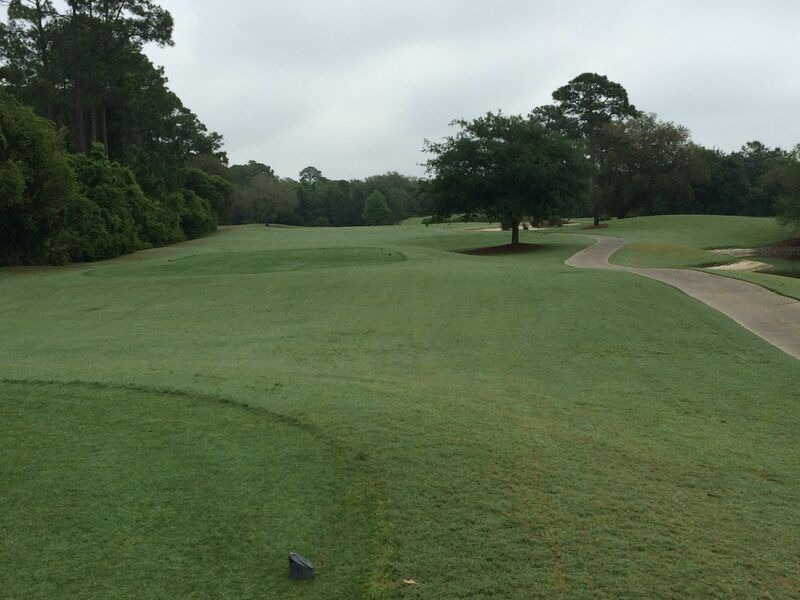 Peninsula Golf Club features three separate nines, all designed by Earl Stone and opened in 1995. My favorite of the three for both course design and conditions was the Marsh course, which features some memorable holes including the short par four sixth and seventh holes, the stellar par three fourth, and a wonderful risk/reward finishing hole on nine. Like at Craft Farms and Kiva Dunes, the on-site hospitality was spectacular at Peninsula, as was the food. I do not mention Lost Key in that statement because when we played it there was no beverage cart and we did not eat on-site as we were a bit cramped for time to get to the airport afterwards. The clubhouse at Peninsula is gorgeous, and it was easy to see why they are well known for their great food and beverage program. The dining and bar area has an open, higher-end yet laid back feel, and dining options are available both in and out of doors, including a classy patio area that abuts a pond and overlooks the first hole tees of the Lakes course. With the Masters being played the weekend we were there, they offered $1.00 pimento sandwiches… Not my style as a fairly picky eater, but Nick and Mike both ordered and enjoyed them. 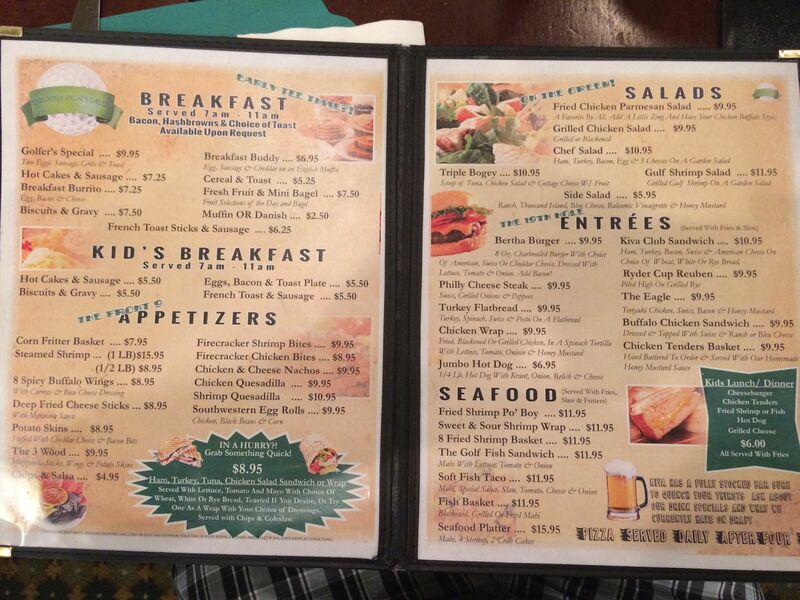 I went with a seafood lunch, as I typically do on golf trips anywhere near a coast. 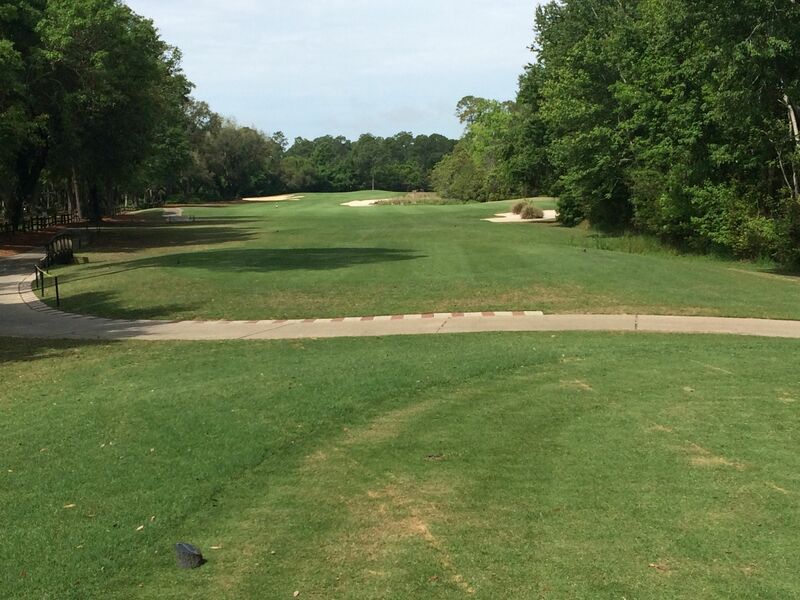 The Cypress course starts out with a tricky dogleg right par four. From the tee box, it almost looks like the hole bends to the left, but driving in that direction will only result in a very long approach shot! 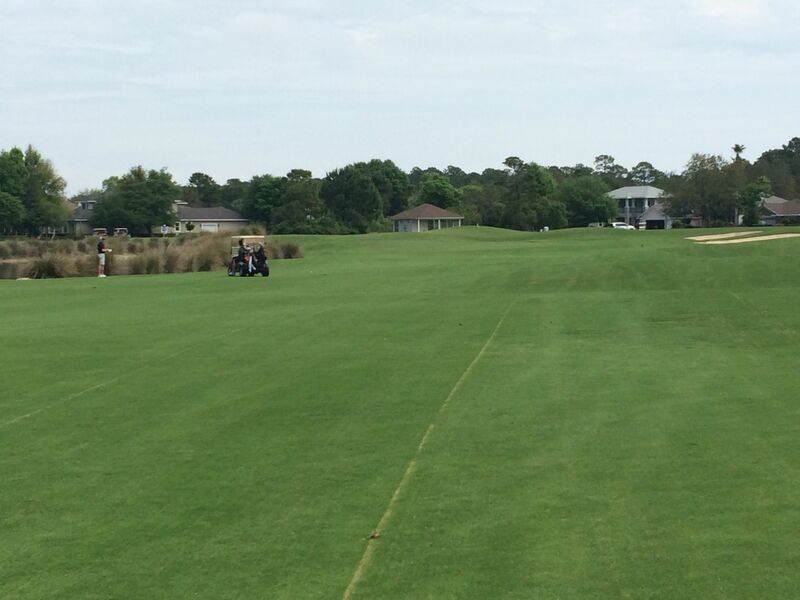 The fairway runs out at long drive distance, and turns hard right beyond the treeline on that side. The first par five on the Cypress course, the pond left of the driving area grabs the eye first, but it is the second pond on the right side of the driving zone that should really draw attention. 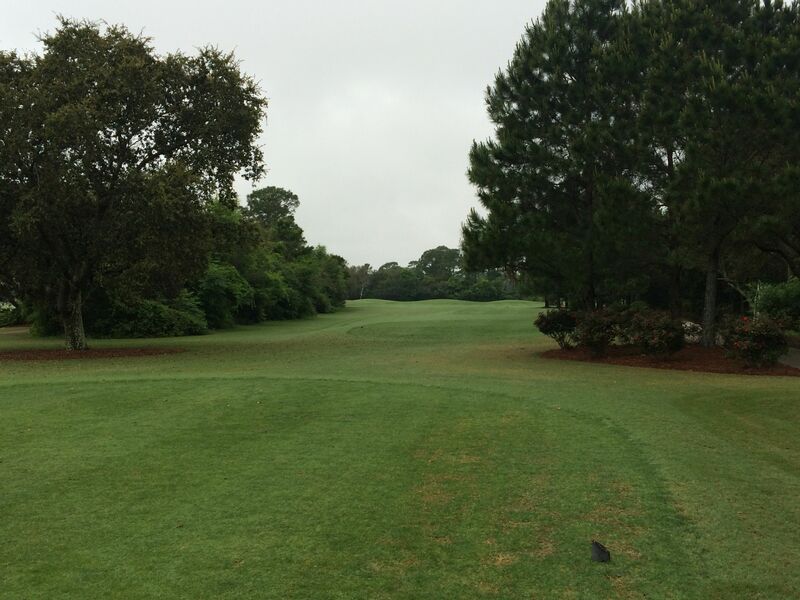 A long par five, the second requires careful precision and is a true three-shot par five. 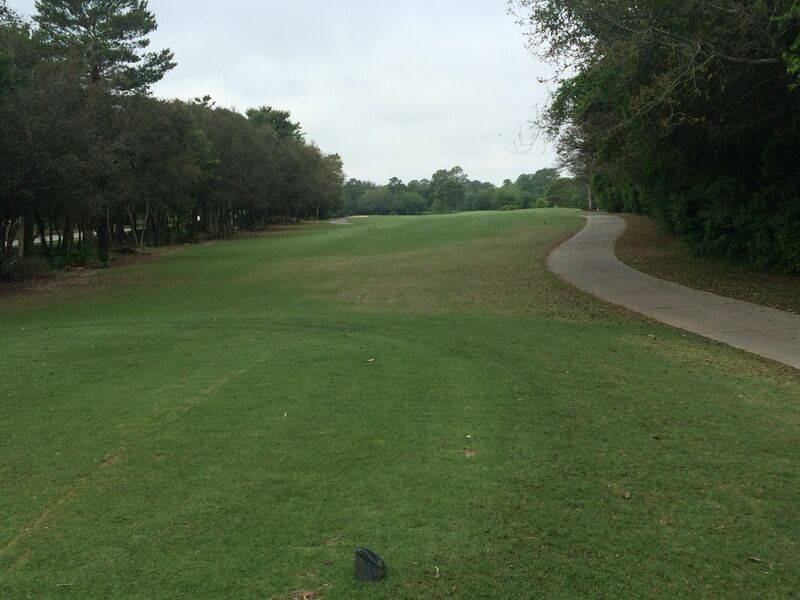 The third is one of the longest par threes on the entire property. 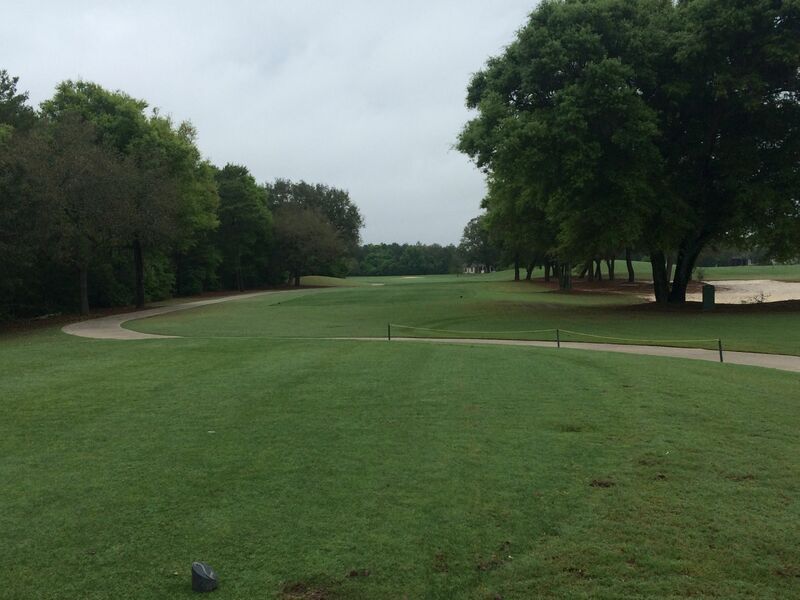 Tipped out at 236 yards, or 214 from the first tees in, the green is rather spacious and can be missed short-right. Anything left will find water or sand, and anything long and right has the potential to find the unseen pond that lurks there. 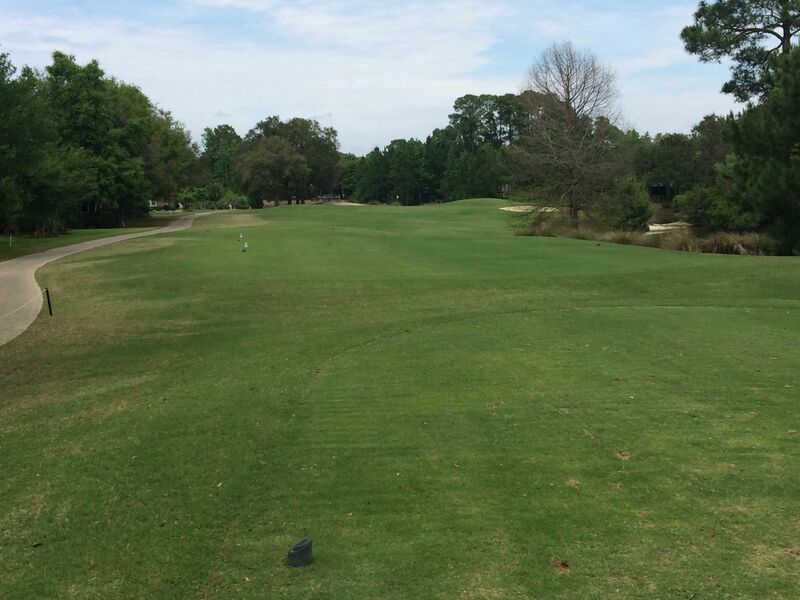 The fourth is a short, but demanding par four. 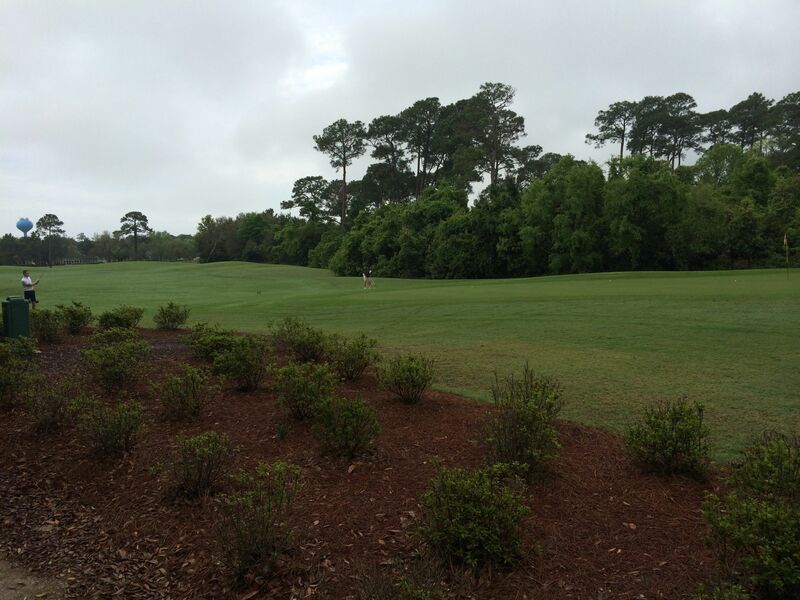 The left side of the playing area is lined with dense forest, while the cart path frames the right side. Trees infringe on the hole further down that side, and the green is fronted by a large tree and a bunker short of the putting surface. 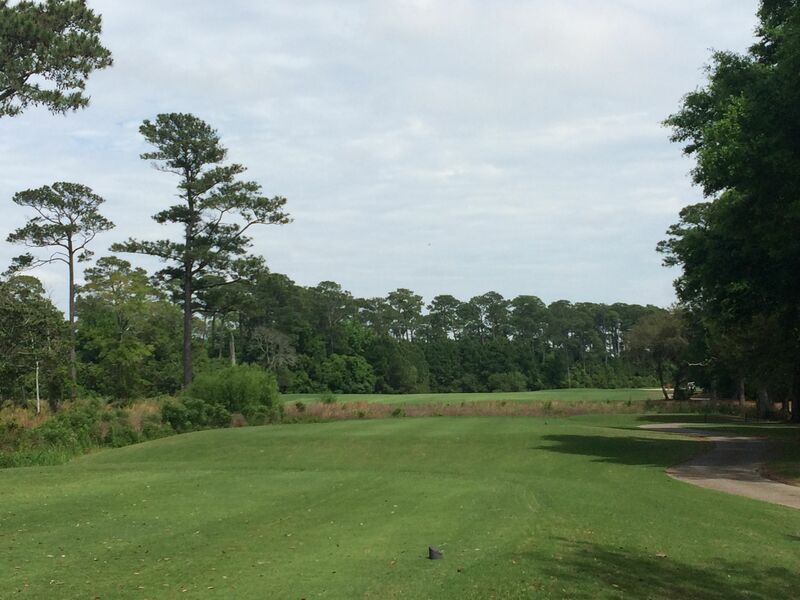 Another mid-to-long par three, the fifth on the Cypress course is slightly uphill to a green that gives very little away in terms of its length from back to front. 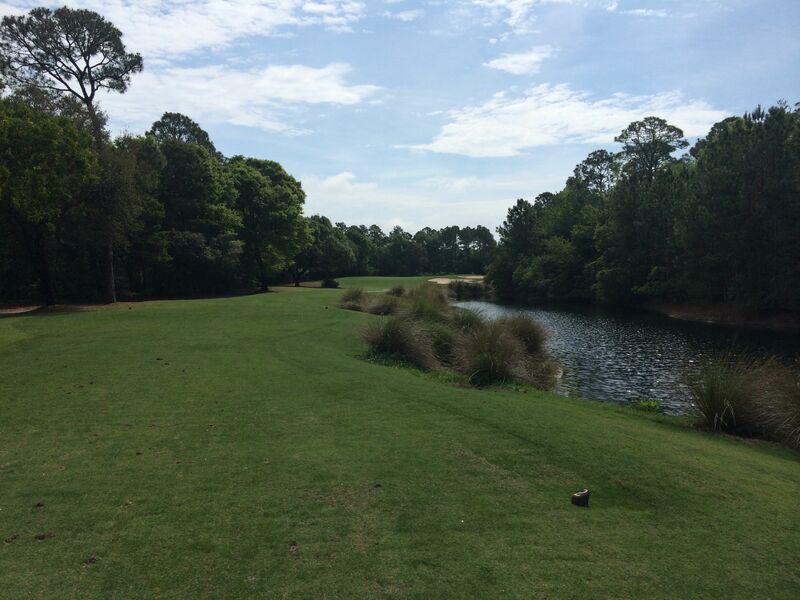 A gorgeous golf hole, the sixth is a long par four of 411 yards from the tips. 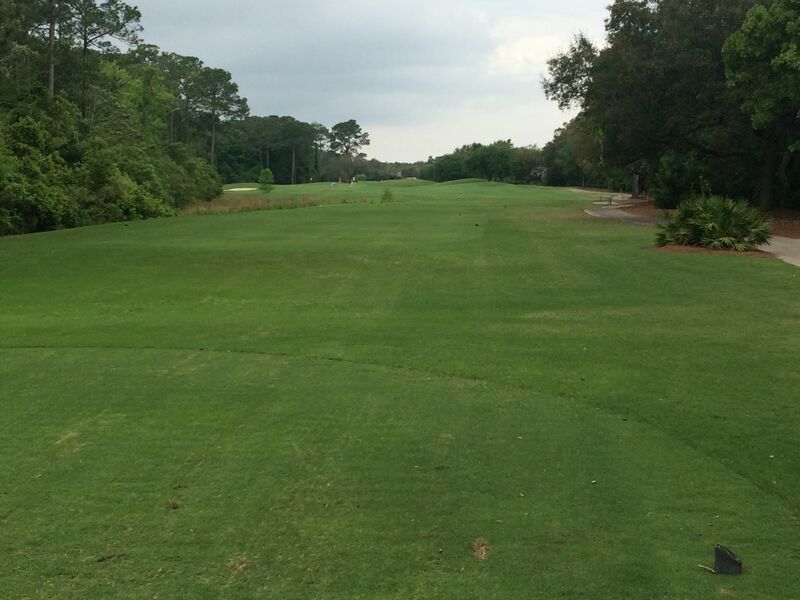 The fairway widens a bit as the driving area opens up, but the toughest shot on this hole is the approach. A large pond is found right of the green complex, which is best played with a run-on shot. The seventh plays straight out from the tee boxes, with an elevated green, fairway bunkers on the right and a trap front-left of the green complex. This is a tricky little hole, and the mounding around the green adds a very nice touch. 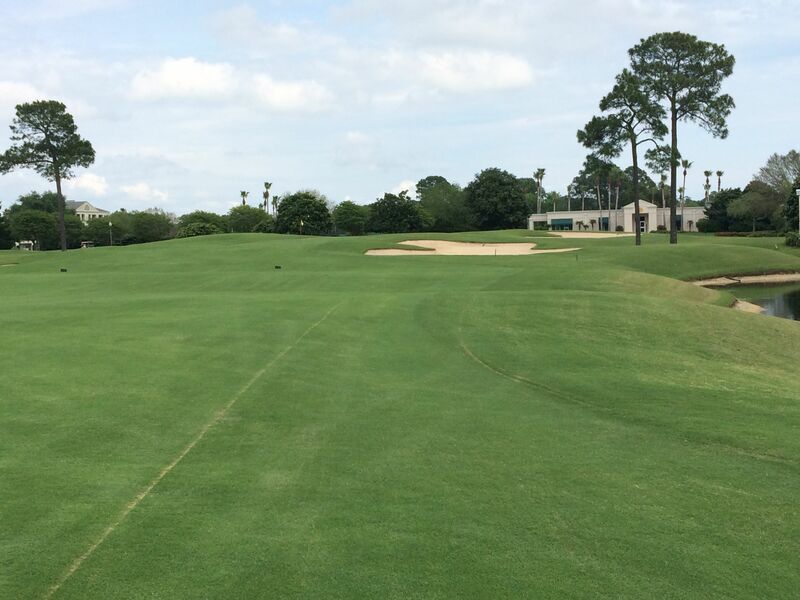 At 608 yards, the eighth is a long par five with a whole lot of hazards to avoid. The large willow trees on the right side of the fairway certainly have to be avoided, as do the traps that line that side of the fairway. 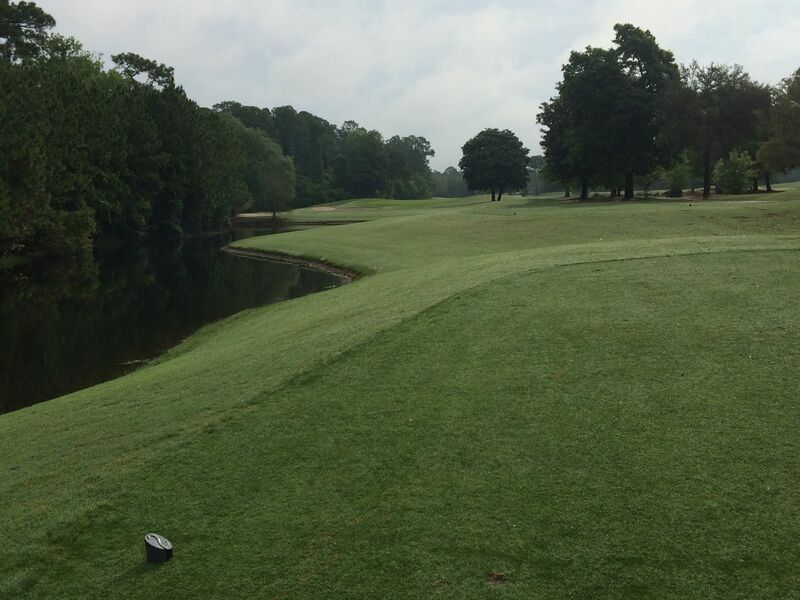 The second shot needs to be played delicately, as any attempt to chew off too much can lead to a lost ball in the water hazard that encroaches on the left side at around 350-400 yards to just short of the green area. The safest approach on eight is to the right side of the green to take the pond out of play. 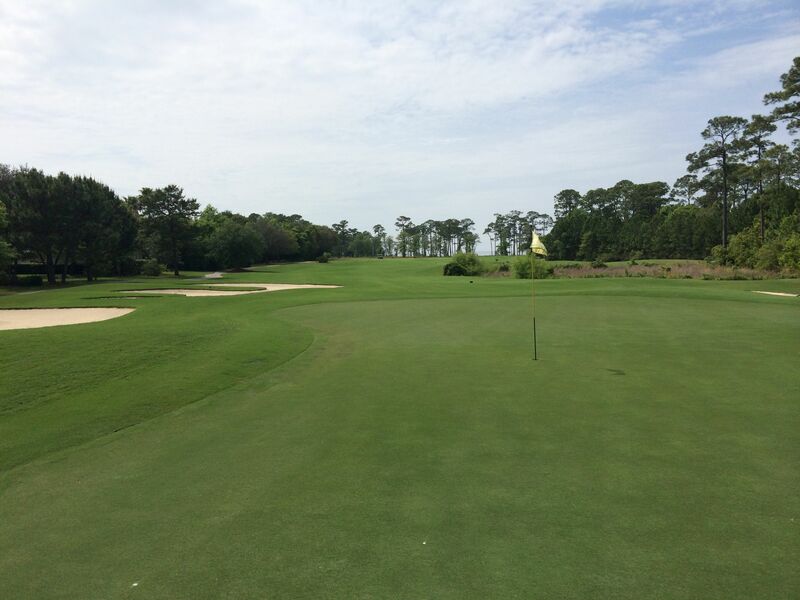 The ninth is a solid finishing hole to the Cypress course, tipping out at 434 yards from the back tees. 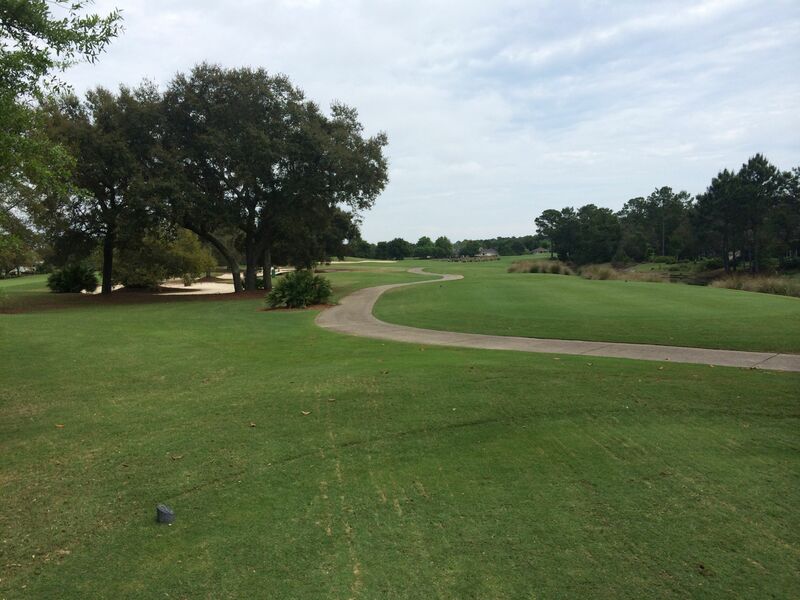 A road runs parallel to the left side of the fairway, so err right, if anything. 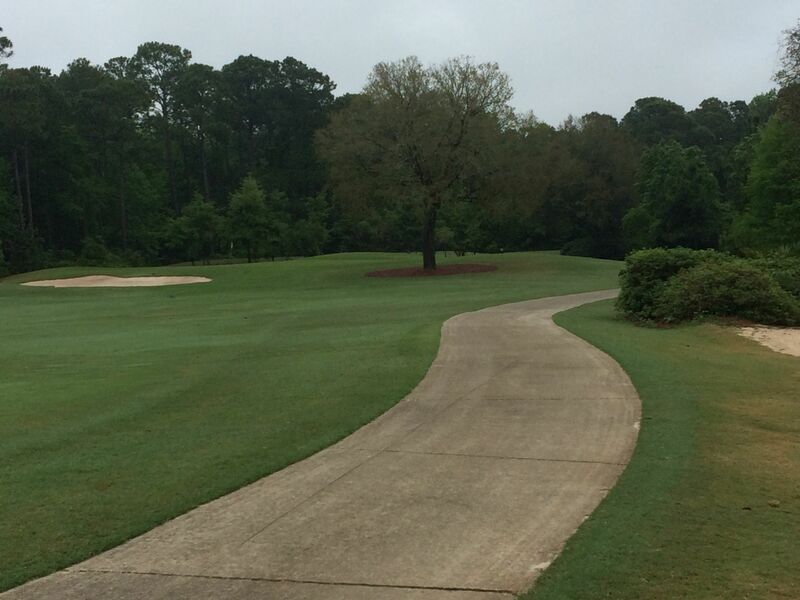 The fairway bends slightly to the left, with trees lining that side of the approach area. 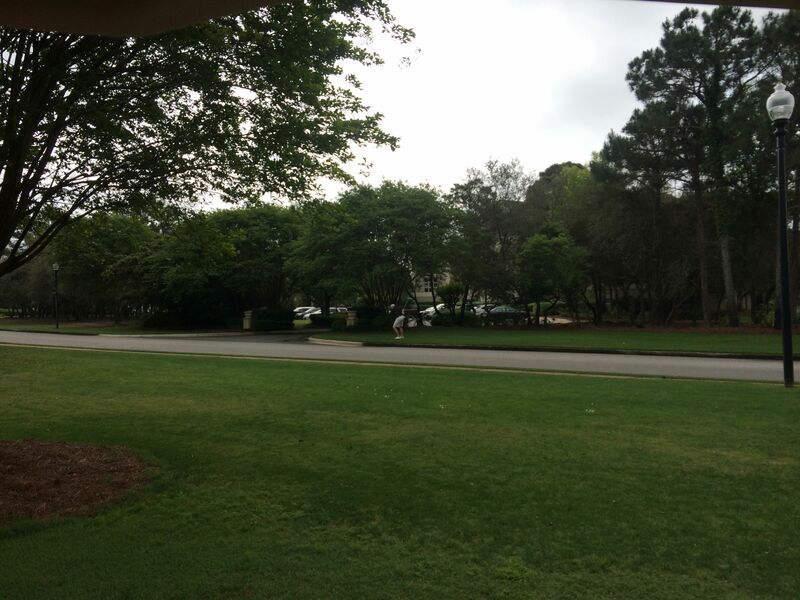 Mike’s tee shot went left, then bounced down the road and in to the grass just past the green – a 450-yard drive that we allowed him to play from out-of-bounds to over the tree and a one-putt for birdie. 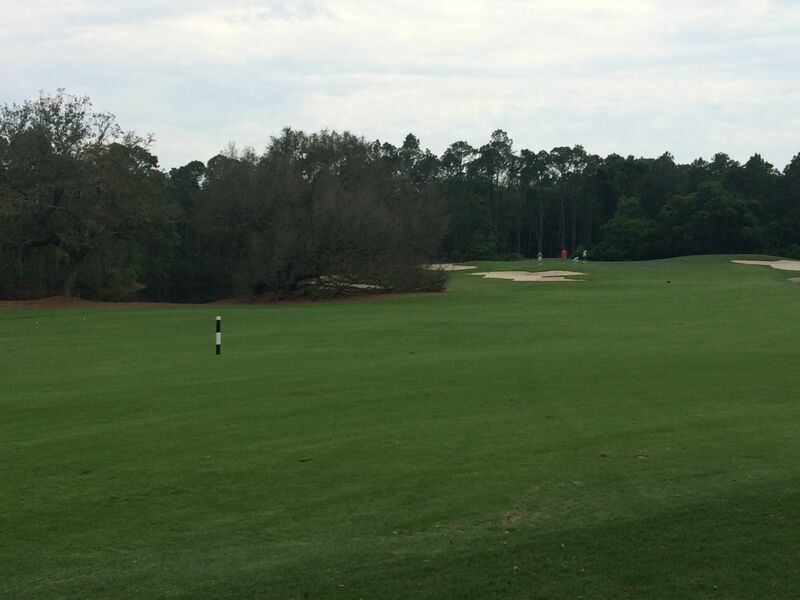 Following our rounds on the Cypress and Marsh courses, the pro shop told us we were welcomed to play the Lakes course, or else re-play one of the ones we’d already experienced. The Lakes course was on the mend from a harsh Winter (I am not sure what happened to it, but the greens were a bit eaten up and there was evidence of some of the same in the fairways), but I had heard good things about the layout and we all agreed we would love to check it out. We were really happy that we did, as the Lakes course has maybe my favorite layout of any of the three nines at Peninsula Golf Club (a lofty statement – Earl Stone did a fantastic job of designing this property!). The Lakes course starts out with a simple enough par four: Fairly straight away with an inviting fairway and accessible green. A handshake at the beginning of any round is always appreciated! The second hole gets a bit trickier. 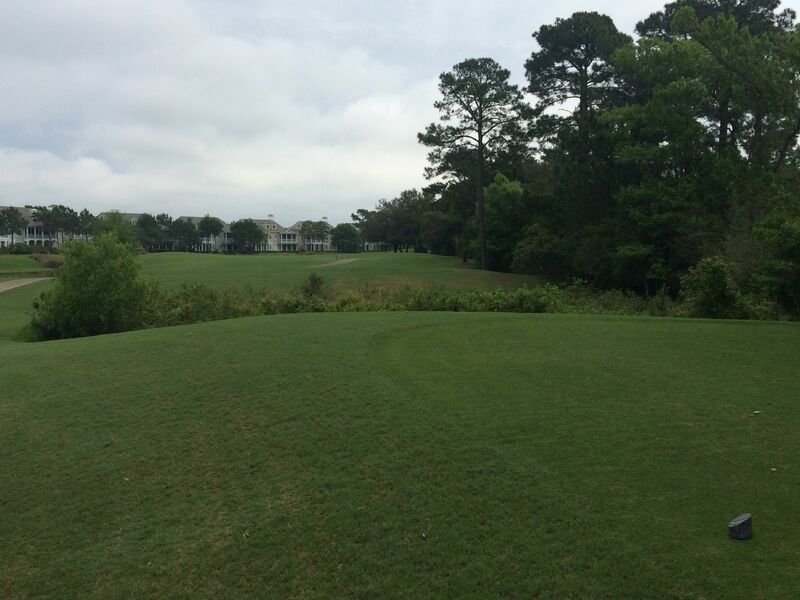 Trees encroach on the left side of the driving zone of the fairway, and right of the right-side rough. The hole doglegs hard left at around 250-275 yards, and provide an obstruction toward the green that will have to be carried. 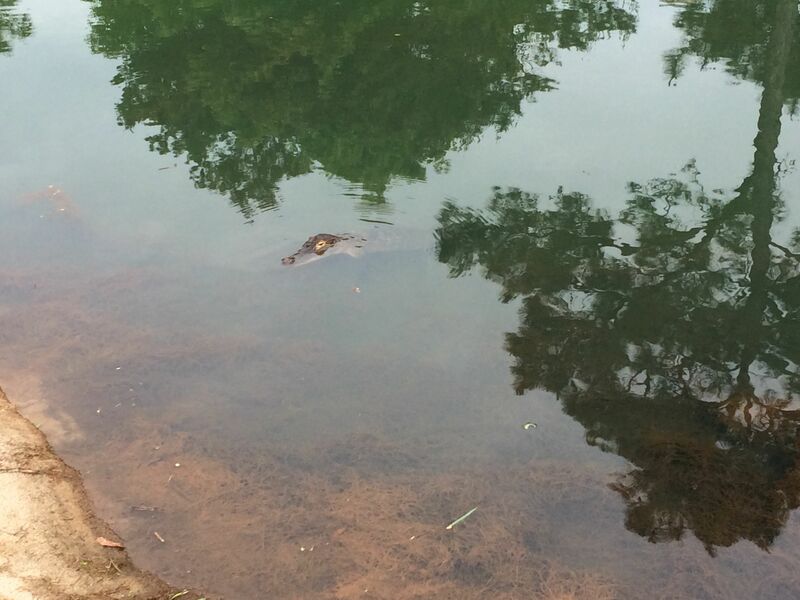 They also hide some of the trouble left of the green, which comes in the form of a large pond and plenty of sand! We were admittedly a bit confused when we got to the tee on three. It looked from the tee boxes that a strong drive over the tree in the middle of the fairway would leave us in good shape. One after another, we hit bombs over this tree, only to drive up to our tee balls and find that we were all in the water. Obviously, an early drive-up or closer inspection of the scorecard would have told us that it was a bad idea, but hubris or something similar took over on this short dogleg left par four. All in the water, with no groups behind us, we re-teed with better information – I was the only one who it really mattered much for, as I took a birdie with an asterisk to complement the rest of the group’s two fives and a six. 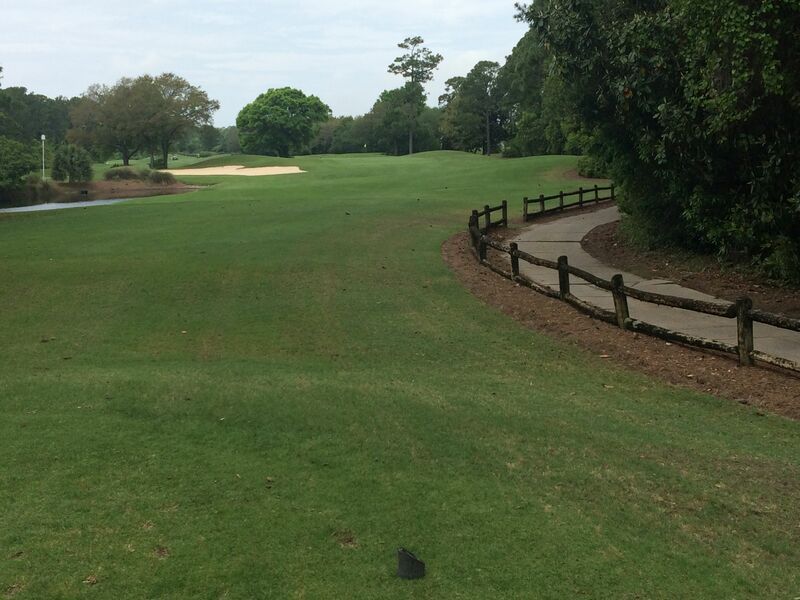 This is a much tougher hole than it appears on the scorecard, though, no doubt about it! 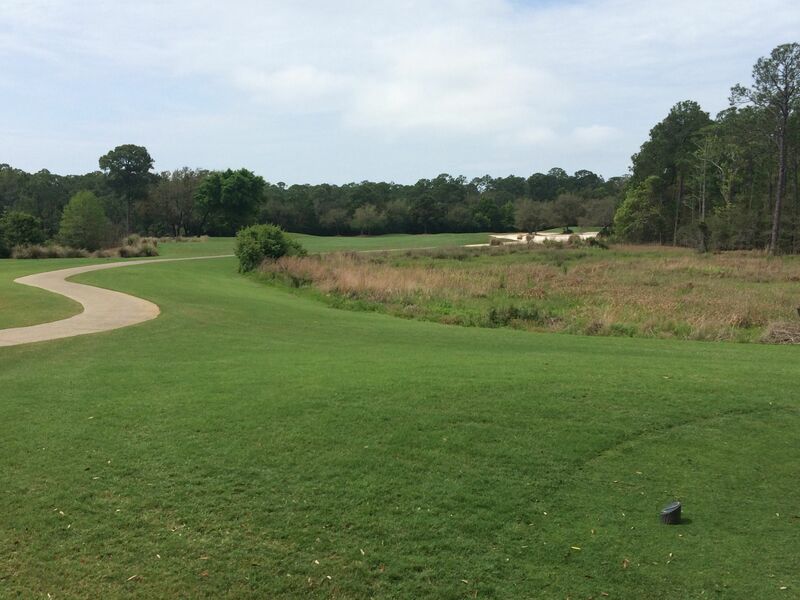 The first par three on the Lakes course, the fourth is a mid-range one-shotter with a punch bowl like green. Both the left and right side are elevated, while a false front makes club selection priority number one. 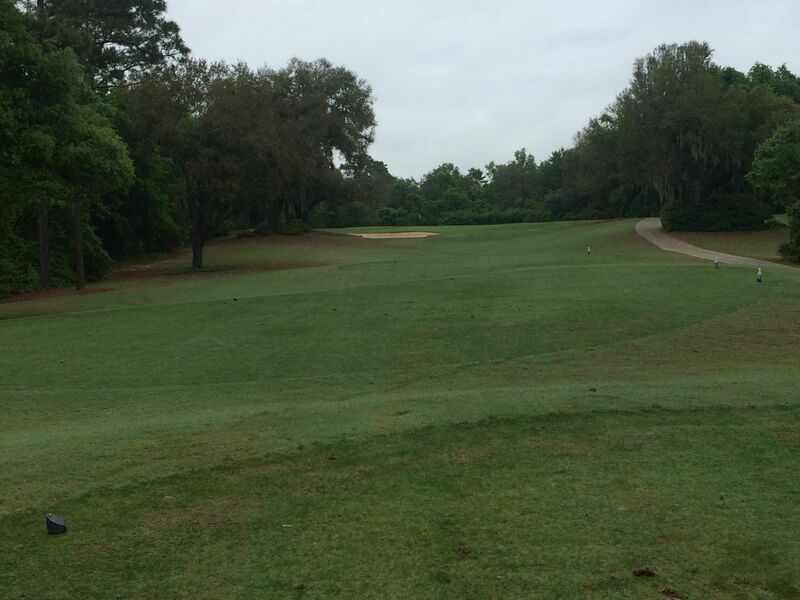 A gorgeous par four, the fifth plays with water down the first half of the right side of the fairway. Just short of the left-side fairway sand trap is a great target off the tee, and will leave a reasonable approach in to green that is surrounded by tall mounding. A picturesque par five, the sixth has a wide fairway beyond the pond in front of and left of the tee boxes that should not come in to play. 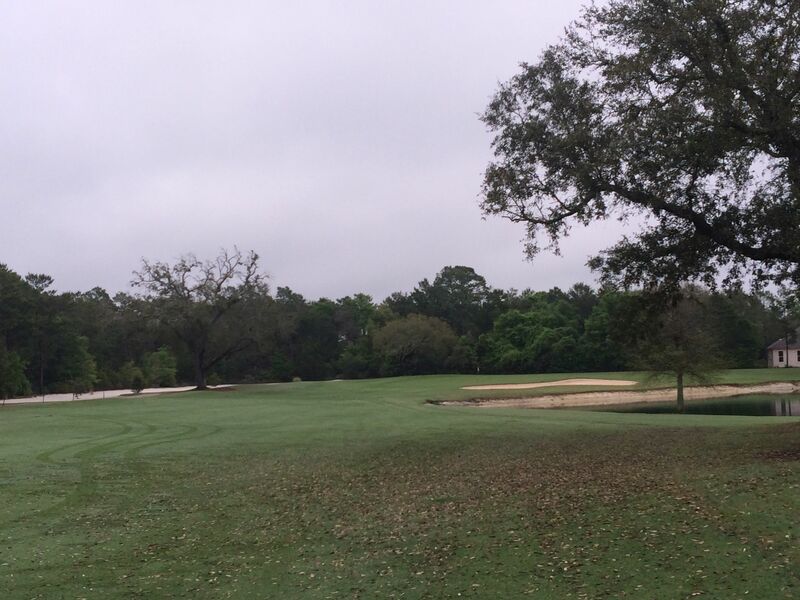 Avoid the trees right, and the traps found at the corner where the fairway bends to the left. 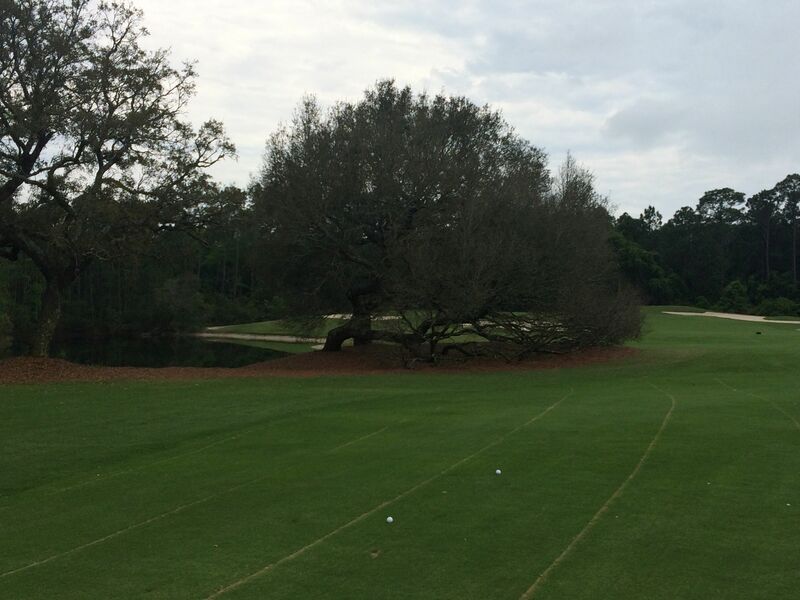 This is a reachable par five, playing at just 514 yards from the tips and 486 from the first tees in. Making the drive to seven on the Lakes course, we finally saw exactly what we’d been waiting for the entire trip: A hole with an ocean view! The Gulf of Mexico spans as far as the eye can see left of the tees on the seventh, and the smell of the ocean and breeze in the air was refreshing and welcomed. 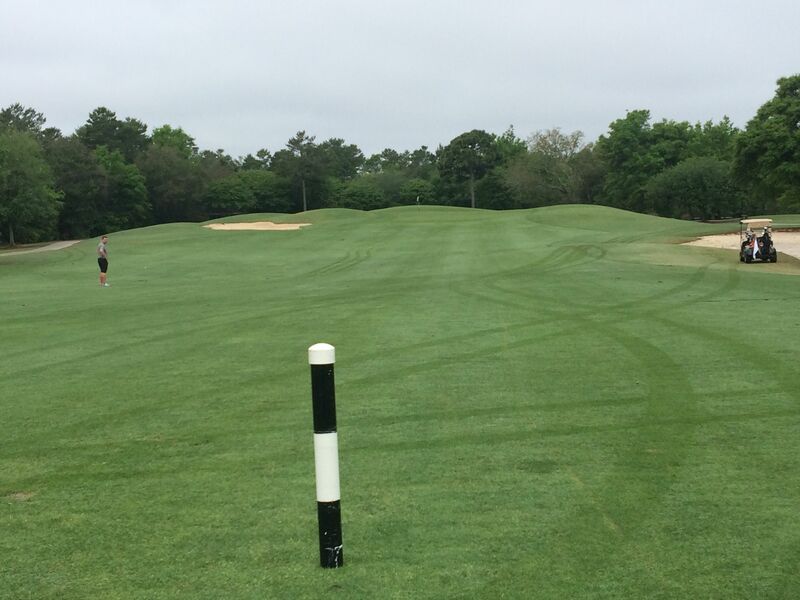 The seventh hole, itself, is spectacular. 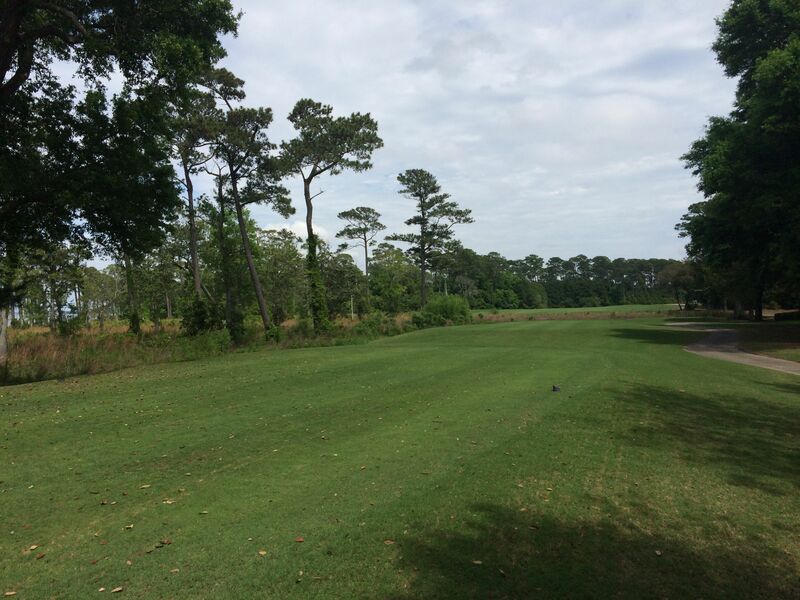 Trees line the driving area on this second of back-to-back par fives, and a marshland comes in to play on the left side around 150 yards out from the green complex. 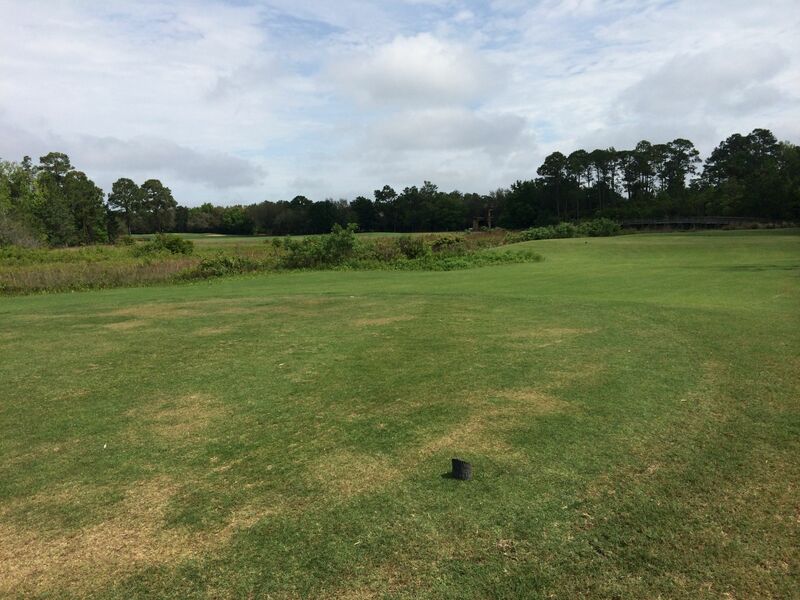 The putting surface is gently risen and guarded by the marsh on the left and a series of finger-like traps short and right. 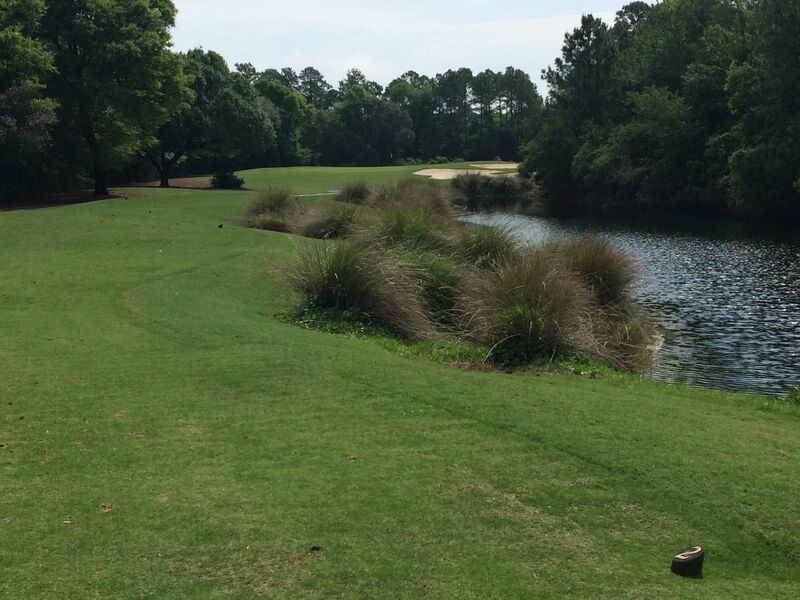 This was one of my favorite holes on our entire Gulf Shores trip. Even though the ocean is only in view from the tee boxes, it was a welcomed vista that we were happy to see… And even had to take a couple of selfies with it as a back-drop to make everyone back home even more jealous. An intimidating “Short” par three, the eighth measures just 140 from the first tees in (180 from the tips), but has a vicious green complex with a steep false front and plenty of contouring. The Lakes nine ends in fine fashion with a long, soft dogleg right that finishes uphill on a green with deep sand traps right. Water lines the right side of the driving area, although a long drive right will clear it (but provide an awful stance and plenty of tree problems – trust me!). 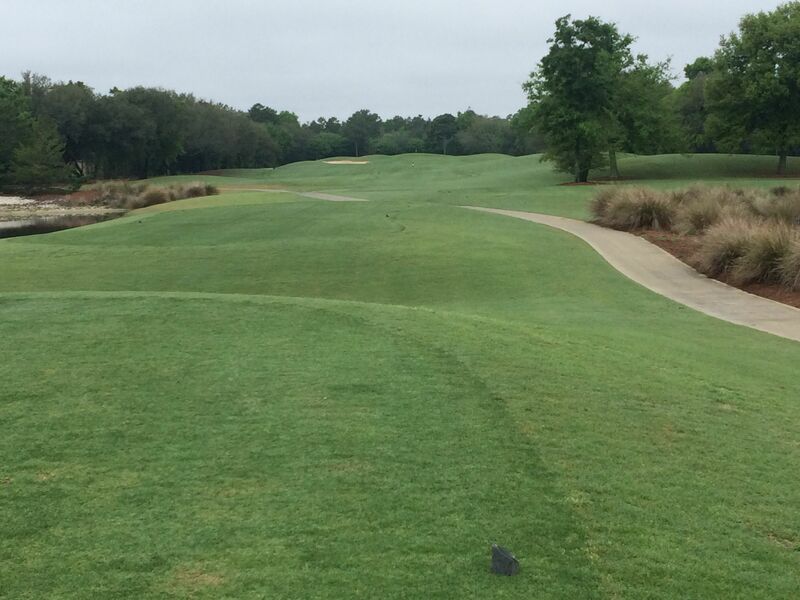 The green on nine slopes hard from back-right to front-left, making shots below the hole integral to scoring. 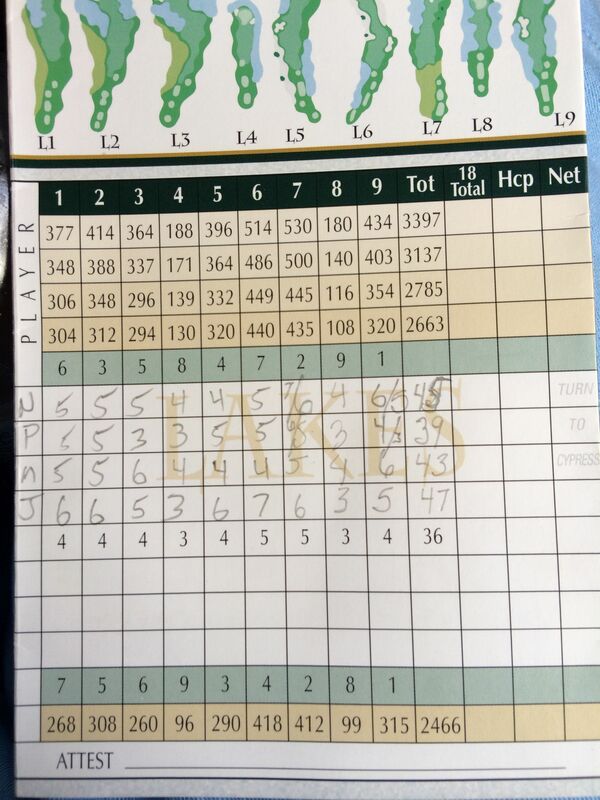 Lakes side scoring at Peninsula Golf Club – Team Seifert/Guerten took it to the low handicap Team Serak/Heerey! We were very impressed with the inter-round dining experience at Peninsula Golf Club. Everyone’s food was excellent, and we even got Moscow Mules. 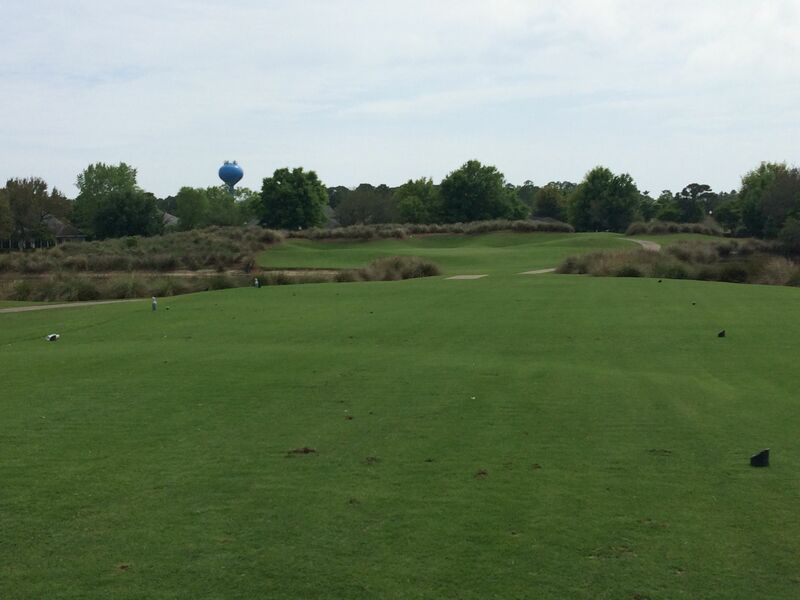 The Marsh course starts out with a dogleg right par four. 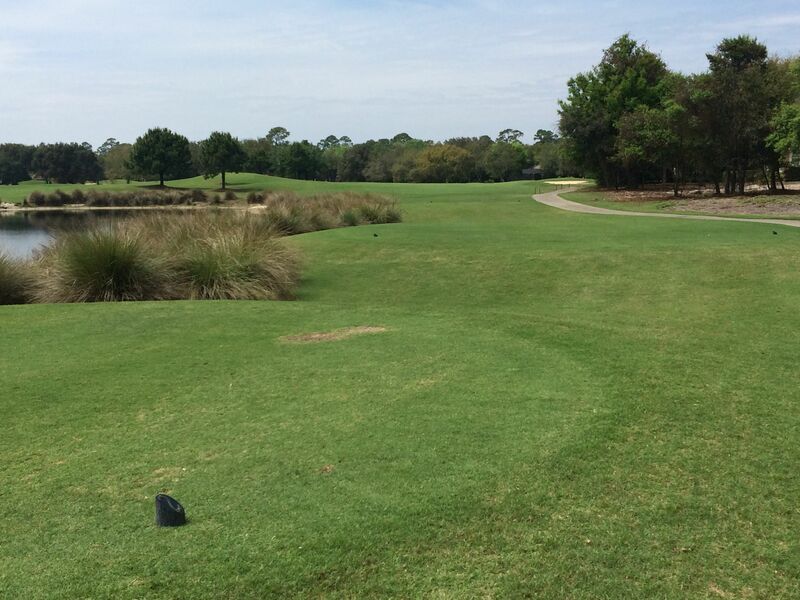 Avoid getting too greedy off the tee on the left side, as the water is within play both on that side and long. I somehow managed to miss getting a picture on the second hole, which I regret as it was a solid par five measuring up to 628 yards from the tips, and 580 from the next tees in. The tees are surrounded by water, as is the majority of the fairway on both sides. 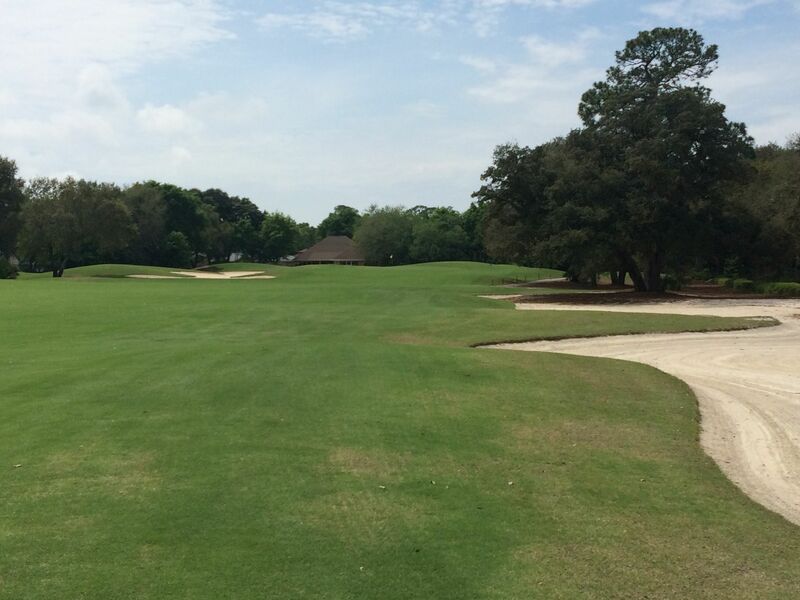 The green has three cloverleaf bunkers that are sure to grab any wayward long approaches. 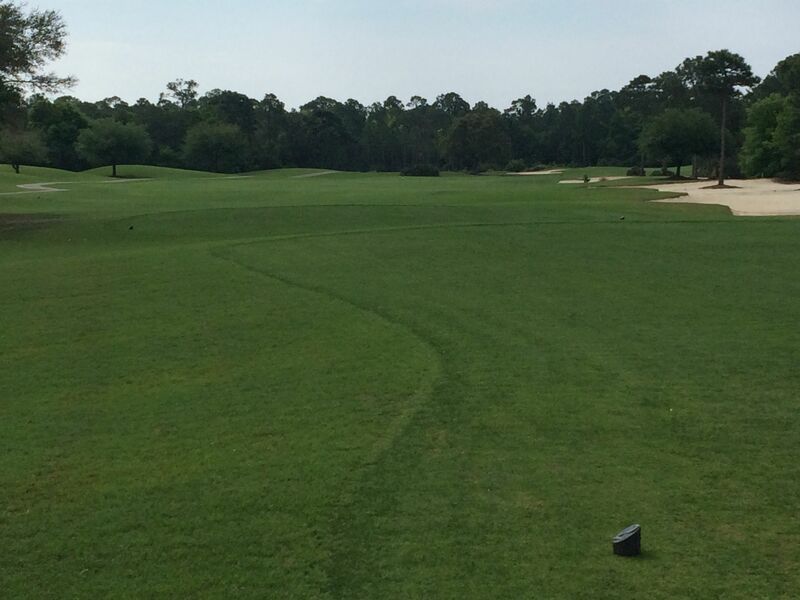 The third is a long par four, stretching out to 456 yards from the longest tee boxes. The fairway bends to the right, with a large wasteland running along the tree line and another just short-left of the green complex. This is a tough hole to score on, and the second handicapped hole on the Marsh nine. The fourth on the Marsh course was probably my favorite par three on the entire course. With water right and in front of the tee boxes, the green is situated between the water, trees and sand to the right. It’s a beautiful hole to look at, and a bear to play! 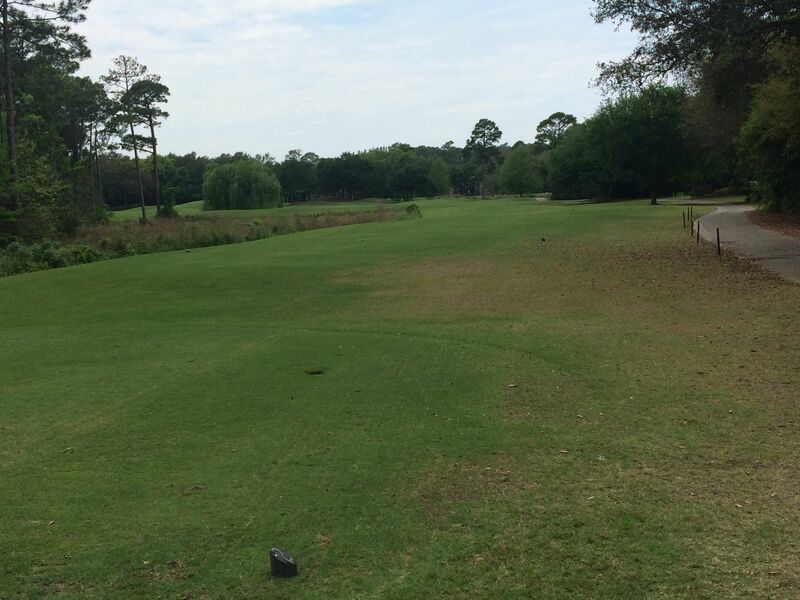 With the wind coming in and to the right, especially, this hole was playing brutally long from 215 yards! The fifth on the Marsh nine is one of the tightest holes on the property, as the rest is quite playable (especially with such fantastic conditions). 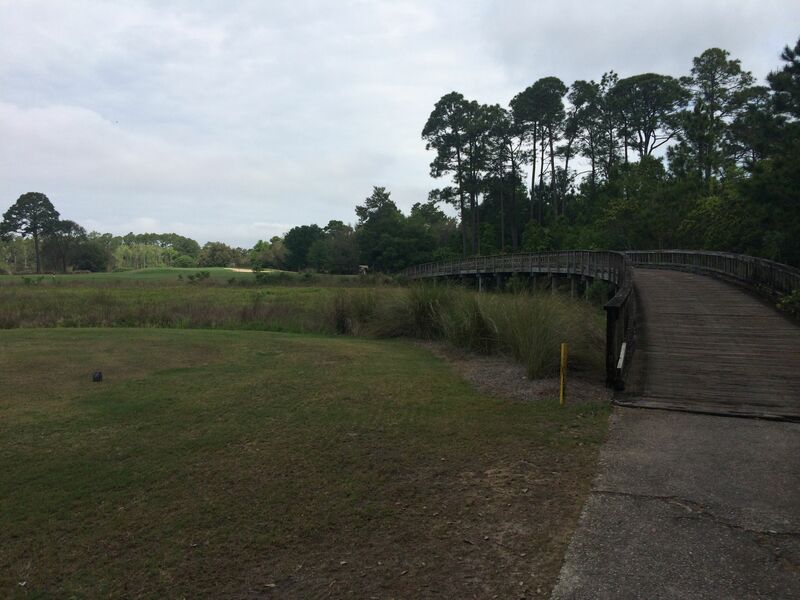 The sixth is a really good looking par four, with a picturesque wooden bridge that crosses over a vast marshland. 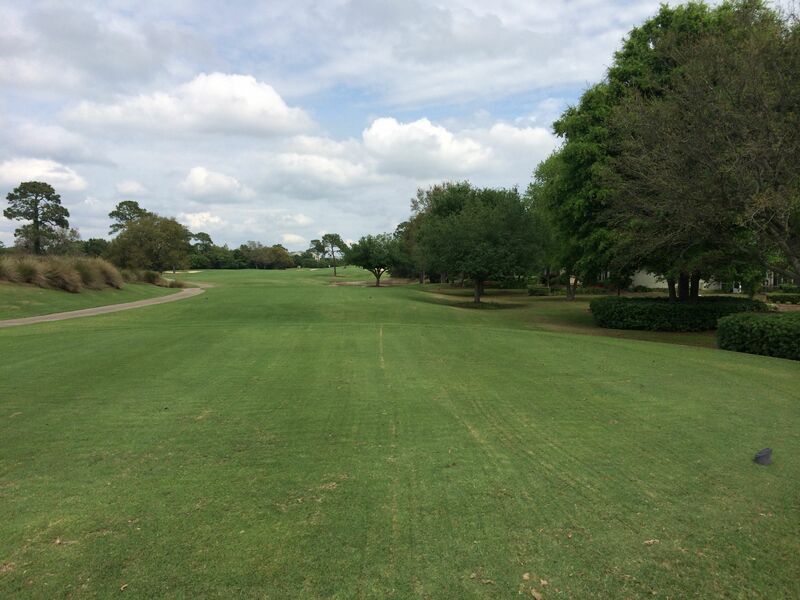 The fairway runs on a right-to-left angle, goading players to take off more than they should on the left side toward the pond that comes in to play nearer the green. 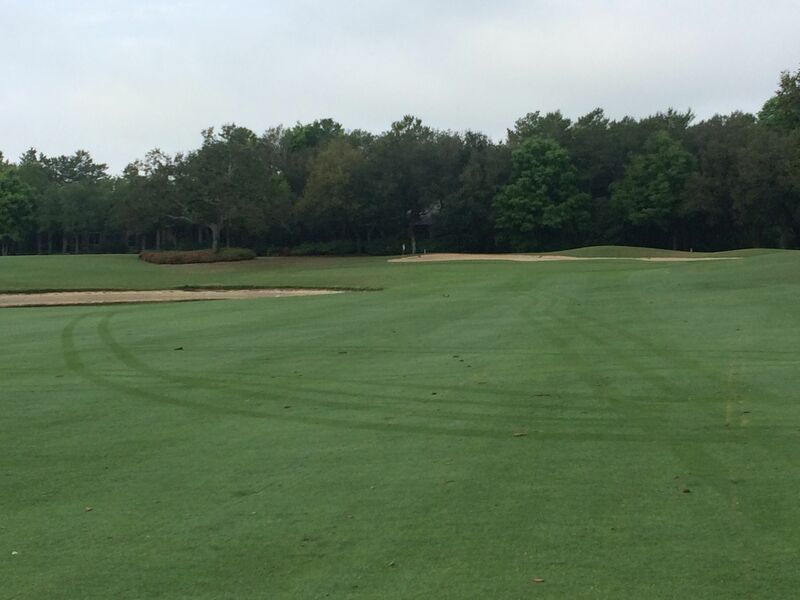 The putting surface on six is one of the most contoured on the entire property, breaking in three different directions. This excellent stretch of golf holes on the Marsh course continues with the par four seventh. 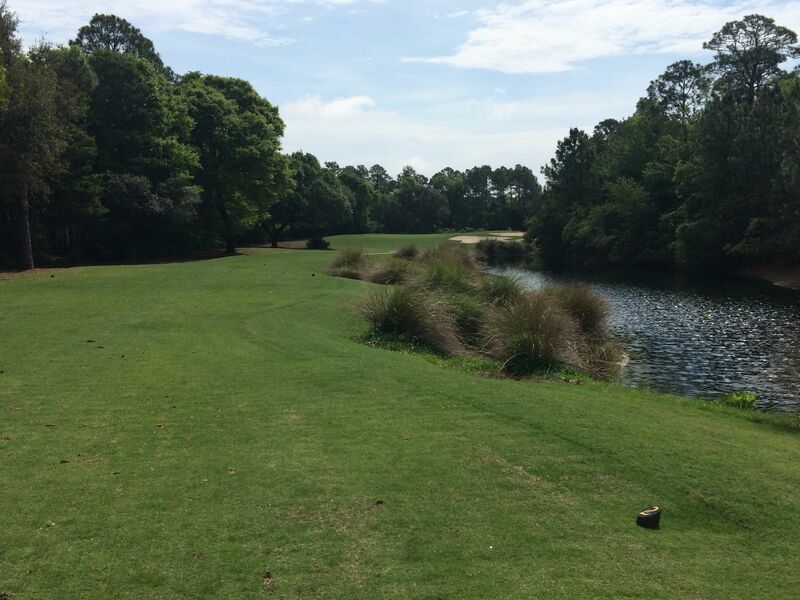 The seventh drives over a marsh to a fairway that doglegs hard from left to right. Several of us tried cutting off too much distance, leaving us in the waste bunker that runs the right side of the driving area. The left to left-center side of the fairway is the most responsible target spot off the tee, leaving a considerably more manageable approach. At 195 yards from the tips, we had an audience on the par three eighth of a couple of cart girls who were selling the opportunity to bet on whether or not we would hit the green. I of course did, and of course hooked my shot left of the green. I managed par, but it was ugly. 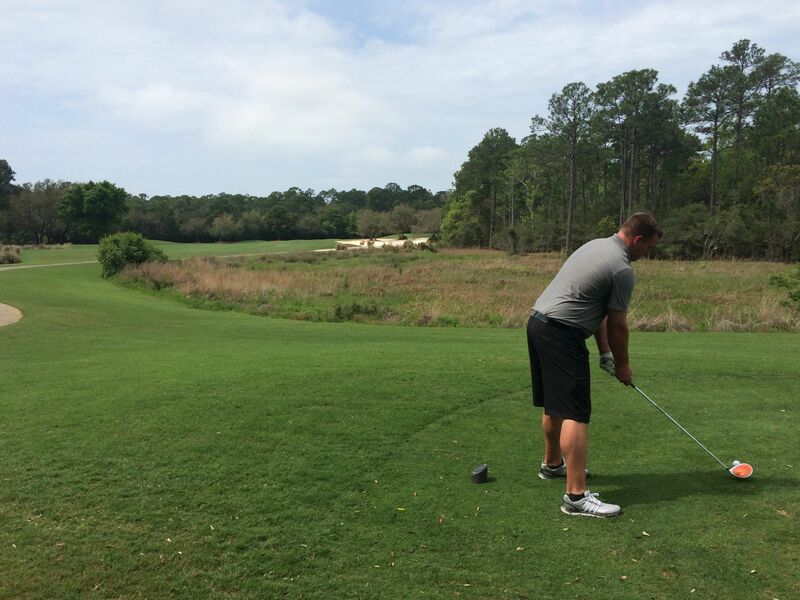 It was at least better than Jeff’s tee shot, which went almost straight right in to the woods. 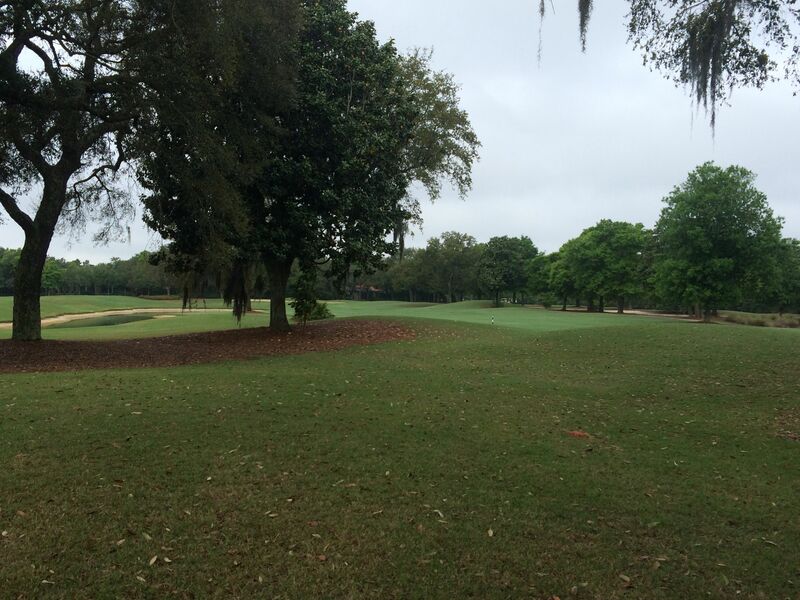 The green on eight is slightly elevated from the front, but drops off hard on the back and left sides. The putting surface is found high above the left-side sand trap. 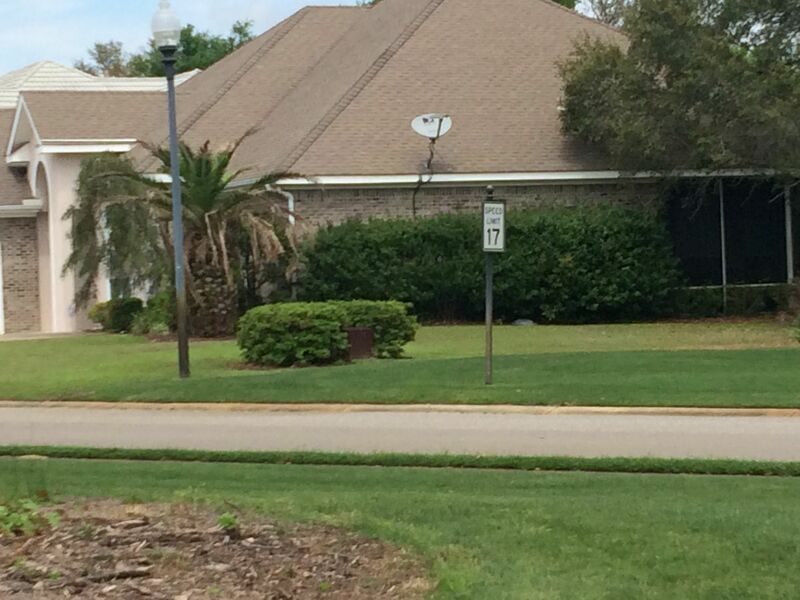 A solid little par three, for sure. 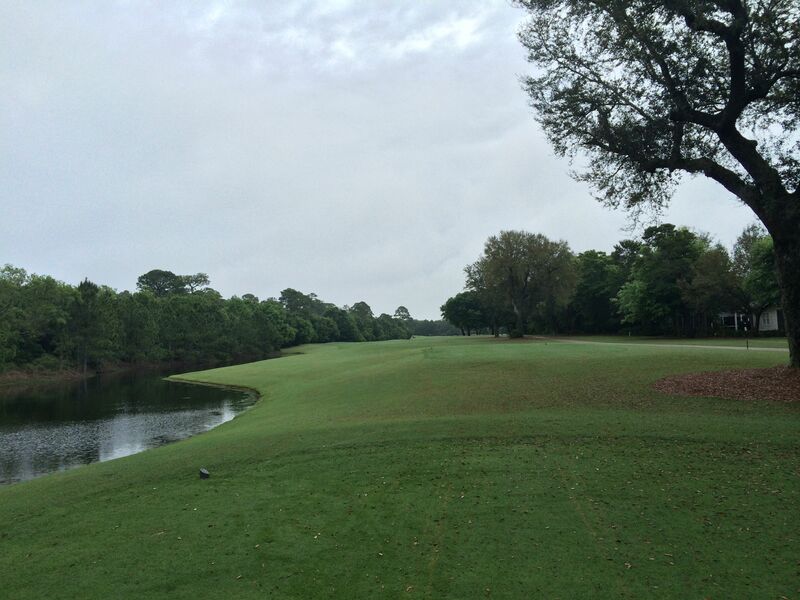 The finishing hole on the Marsh nine is a demanding one with several large marshlands that must both be carried. 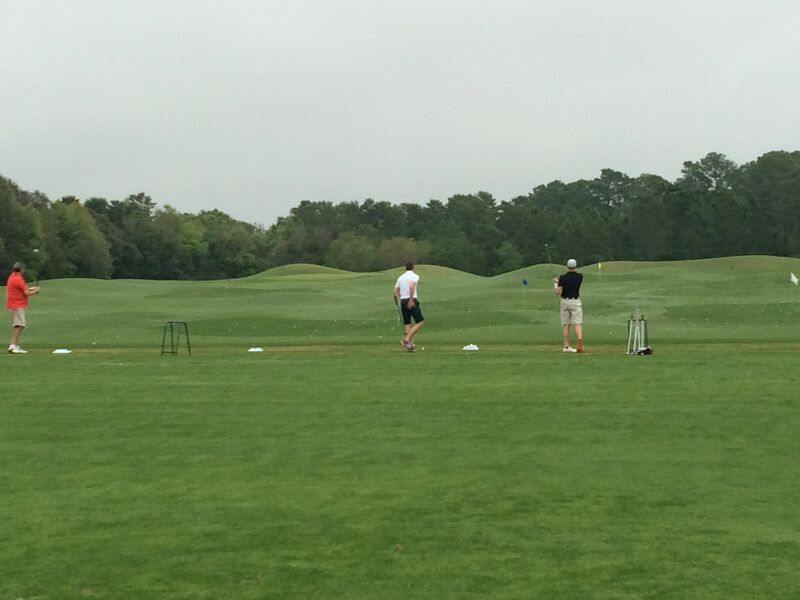 The first one has to be carried on the left side of the tee shot, while the second needs to be carried to set up a short approach from the right side of the fairway… To normal golfers. Mike crushed his tee shot on this hole, leaving about 230 in and a 3-iron that he put pin-high for a great look at eagle. The best strategy on nine is to follow the right side of the fairway to set up a shot that will be shorter over the pond that fronts the green-side complex. I cannot say enough how impressed I was with the Peninsula Golf Club. 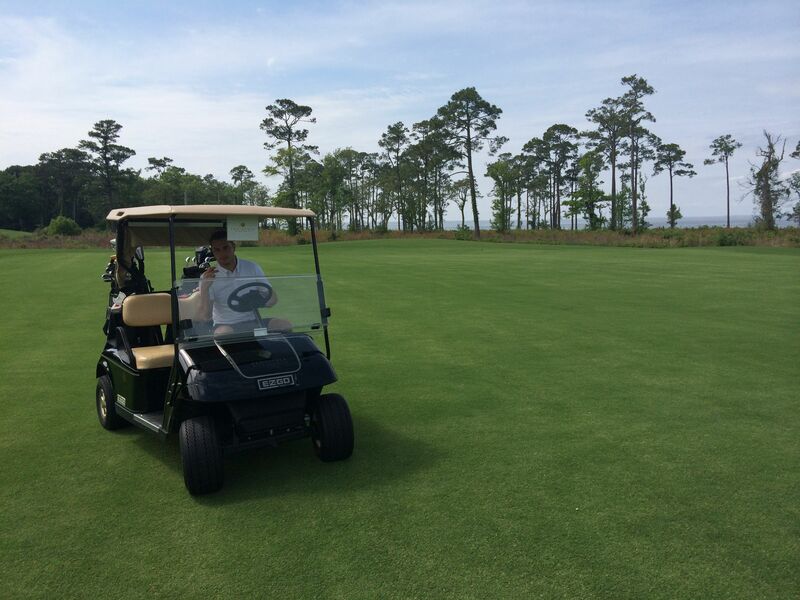 For playing conditions and design variety, it is absolutely unmatched in comparison to the other courses we played in the Gulf Shores, although I suspect Kiva Dunes’ greens usually play a little faster than they were while we were on site. 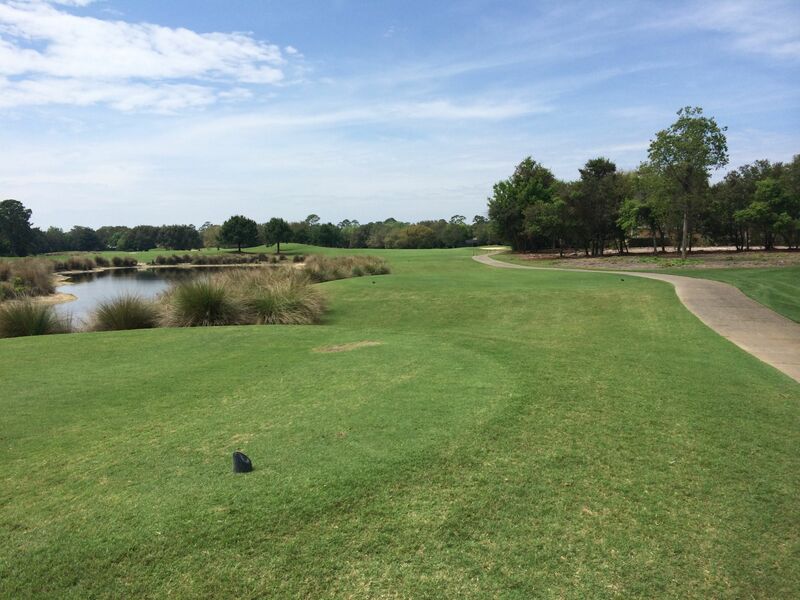 For a great 27-hole day of golf, Peninsula provides a fantastic golfing experience. Make sure it is at the top of your to-play list when visiting the Gulf Shores of Alabama. Great course,way overbooked ,5 1/2 hour round. Disappointing!!!!! Great post, good job. 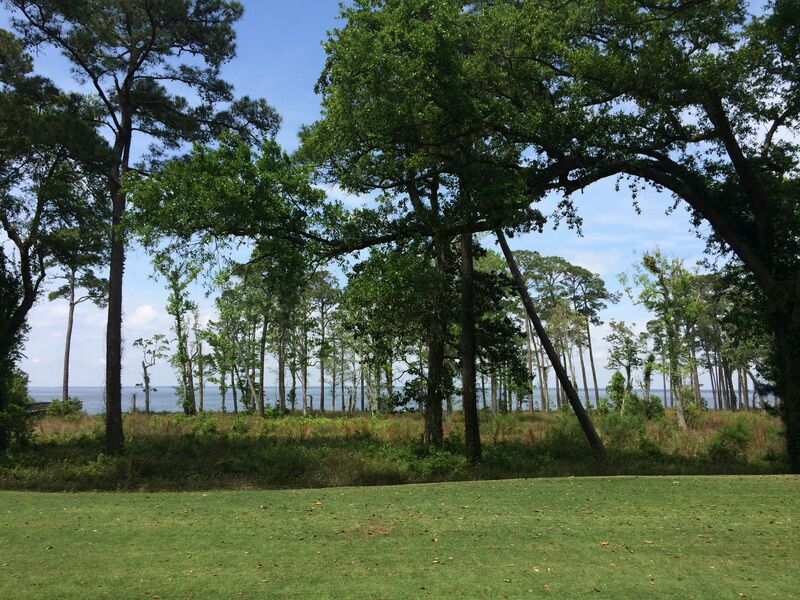 It has been quite a while since I played there, but I agree there is good golf along the Alabama gulf coast. My aging memory doesn’t include the Peninsula Golf Club but it does have a fond spot for both Craft Farms and Kiva Dunes. I’ve got to get back over there. 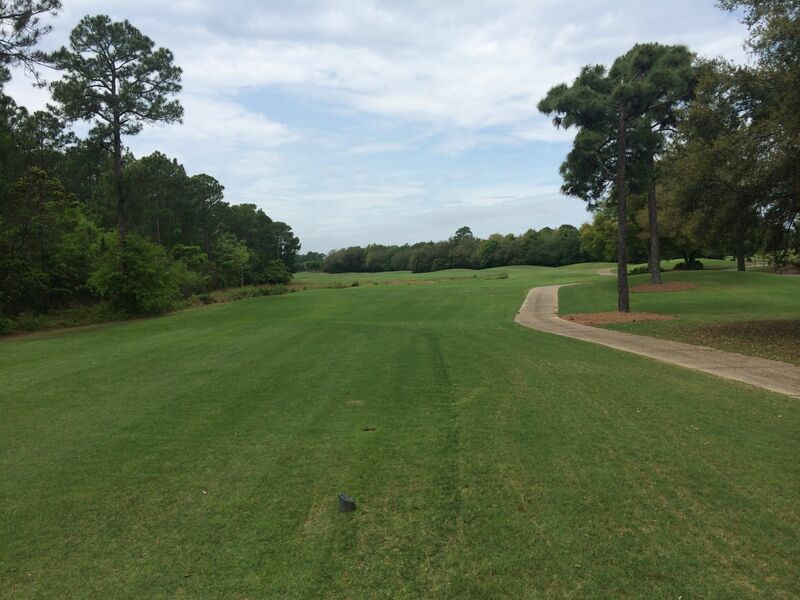 There’s a lot of good golf in the Gulf Shores, Alabama area, that’s for sure! Kiva’s a really good, challenging course already, and they’re currently putting a TON of money in to it to recapture the #1 in Alabama title. Should be outstanding! 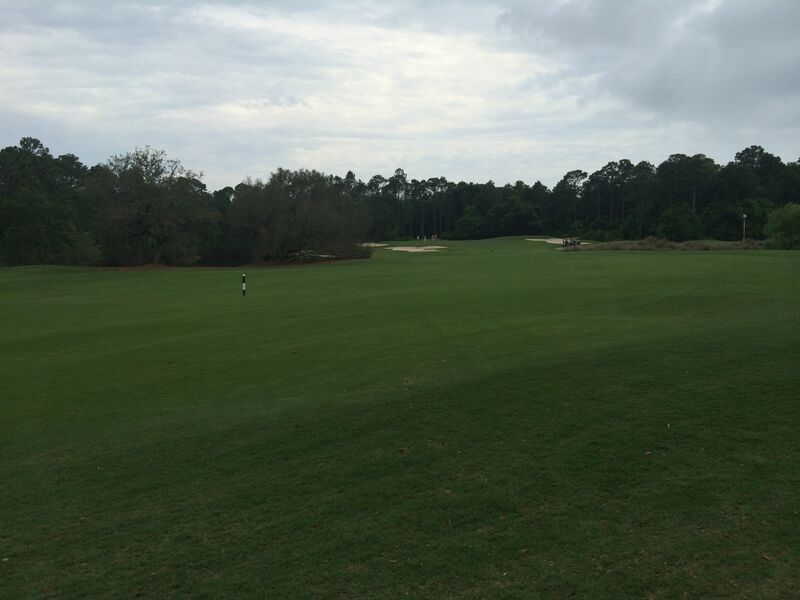 Peninsula is a great course and facility. I think we had the most fun at Peninsula, and it was really in awesome shape while we were there. Highly recommended area for a golf trip. Good stuff here as always. Too bad about the greens on the Lake course, but glad you enjoyed the layout. Love seeing courses from parts of the world i’ve never been too….goes to show you there is great golf to be had no matter where you are.